Slate: One thing though that, as far I can remember, doesn’t have roots in another Zelda title is cooking. I think that was a brand new addition to this game, and I wonder where the idea for that came from. Fujibayashi: When we talk about cooking, when we were thinking about the game action and also the scenario, we definitely wanted to incorporate a feel of adventure. And in that big world, in the big field, we were thinking what could portray that. And one of the things was camping or survival. And so, we thought it would be a great element to add in if we could incorporate cooking. So initially when we were thinking about Breath of the Wild, the cooking system was much more complex, but we wanted to make it easy and fun. So in the final version, we kind of ended up with that pot system, where people could throw in ingredients into the pot. Also, we definitely paid detail to the look of the food. 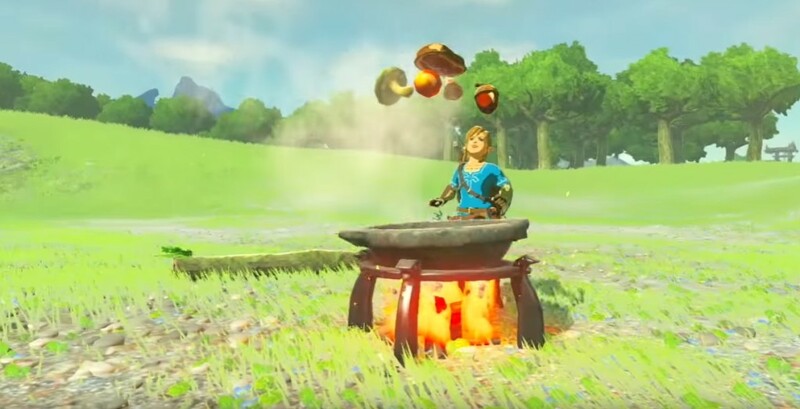 For example, when Link’s eating or the food pops out of a dust cloud, we just wanted to make it look delicious and for players to be excited when they’re adventuring to see these delicious foods and use them. And we also didn’t want to make it too realistic for that reason. We wanted to make sure that the visual was also there too. Aonuma: Obviously in this game, cooking is one of the main ways, or really the main way, that you restore your health. Previously in Zelda games you would cut grass and there would just be hearts, and then your hearts would get refilled. And now in this game, you have to cook, which is obviously a very big change. To talk a little bit about how that became the healing system, initially we had basically a hunger system in the game where Link would move around and he would just continuously get more hungry. And then if he got too hungry, he wouldn’t be able to move anymore, and then you would need to cook something and eat something. It was just a bit annoying to play because you’d move around a lot and then you’d be like, “Oh, I have to cook now so I’m able to keep moving around.” So it became more of a chore than anything else, so we thought, “How can we make it fun and make it something that people want to do?” And that’s how we ended up making it the healing system. And I think if we just say, “Alright, in this game, you’re going to cook to heal yourself,” it makes you think, “Why did it end up like that?” But when you look at the development process, it ends being just a natural conclusion to the process of trying to get the cooking system in the game. Slate: It also seems that it gives players a little more flexibility, because of some of the stat bonuses, to approach things in different ways or, maybe even for more beginner players, a way to help them overcome some of the challenges. So, I imagine that was a goal as well. Fujibayashi: As for stats, a lot of the time, we didn’t want to add explanations. So when people need the food, we were hoping that they would find new knowledge by cooking the food and seeing these bonuses, or maybe imagine when they cook, “Oh, perhaps this is the effect that this food will have.” We wanted players to keep on finding new things or finding new information. But what do you guys think? Did you like the new cooking system or did you prefer the original healing system? Let us know in the comments below!